Childproofing your office can be an easy process. We'll show you how to get it done. Having a home office is a wonderful way to stay active in the working world while still enjoying time with your children close by. But, safety is an important consideration: how can you childproof your home office? Keep copiers, keyboards, printers and other pieces of equipment safe from spills and messy fingers by protecting them with covers when they are not being used. Safety straps can be purchased to secure these items onto desks or other surfaces so that young children don't inadvertently pull them down. Paper shredders deserve a special mention because of their potential danger to children. Keep your shredder unplugged when you are not in the office, and if possible, keep it out of reach of the children. Cabinets can seem like magical hiding spots for young children. Childproof your cabinets by fastening door stops to cabinet doors, which will make doors unable for children to open. Likewise, little fingers like to explore drawers. Keep drawers closed when they are not in use; you may even want to consider locks on drawers. Be sure that cabinets and large storage units are secure and cannot be easily tipped over. 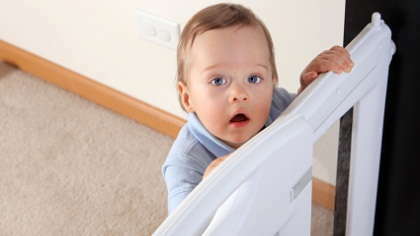 Electrical cords and outlets are an area you will need to babyproof in your home office. Plug all unused outlets with safety plugs to avoid curious little fingers. Fasten extra electrical cord lengths with zip-ties to minimize dangling cords, and tape cords to the ground to avoid tripping hazards. Safety covers can be purchased for power strips to further childproof your home office. Check the corners of all furniture and equipment in your home office. Try to purchase items without sharp edges, and if you do have sharp corners, try to put those against a wall where they will be far from your children. Tape, printer ink and toner, rubber cement - they sound harmless, but you might be surprised at what a baby or child can do with them if they slip into your office unsupervised. Other supplies such as rubber bands, paperclips and pins can be choking hazards for children. Store all supplies out of children's reach. Invest in a trashcan with a lid. Open trash containers are tempting to young children, who may be looking for a treasure. At this point, you may be wondering what exactly you can store in bottom drawers and cabinets when you are attempting to childproof your home office. These spots are ideal for toys, games and children's art supplies. With the right tools, your children can have fun in your office without distracting you, and they can entertain themselves safely as well. Trying to childproof your home office may seem like a lot of effort, but it's essential if you will be working at home in close proximity to your children. Everyone will be happier and more productive in a safe environment.